Works great as either a kettle or pot and cleans up easily as well. So, a first off disclaimer. I did not test this item in the field, but rather in the controlled environment of my travel trailer. However, I don’t see this performing any less well outside. 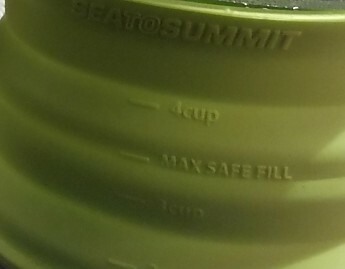 I picked up the Sea to Summit X-Kettle/Pot from CampSaver where it was on sale. I was pretty excited as I’d wanted to get ahold of one of these, but thought the nearly $45 price tag to be a little too steep for yet another kettle/pot. To be fair to me, I currently own at least a dozen pots and six kettles of varying sizes. However, since the X-Pot Kettle is at 1.3L, I only own two pots of that size and two kettles of that size. I removed the packaging, and pulled the specialized rubber band from around the pot and expanded it. I liked it right away. It doesn’t get too tall, and to aid in stability, the body slightly tapers inward as it goes upward. I also liked how the handles when lifted up, act as a lid “holder” when you go to move it off the stove and pour water out. This is due to the way the handles are aligned with the pot. In the picture below, you can see how they straddle the pouring spout, while coming together on the other side of the pot. I find this arrangement to be far superior to any other kettle handles. This setup provides a greater level of stability when moving or pouring the kettle. There’s no noticeable swaying that can happen with most kettles that have a bail type of handle. 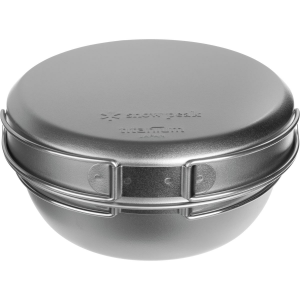 There’s also a little lid handle made of silicone or rubber on the top of the lid which allows you to either hold the lid down securely, or to lift it off to check on either the level of boil, or to stir whatever’s cooking. Another additional feature to this handle setup is that while the handles are up, you can’t remove the lid. I like this because it means you have to put the handles down before removing the lid. 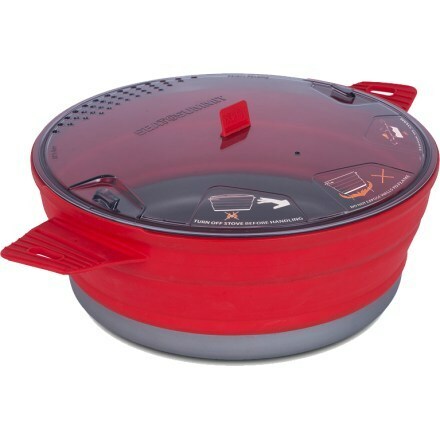 This allows you to vent some steam off before lid removal to prevent burns. Others I’m sure will find this to be a non-issue, or a potential disadvantage. In the pic below I was trying to illustrate the amount of flame that seemed safe to me. I was using a gas burner that was remote from the canister, and had it set fairly open. In use, the kettle is quite rigid when expanded, and I had no feeling that it would collapse on me without warning, despite having boiling water in it. I have used it to boil water for instant coffee, hot cocoa, and tea. It has done this well, and the boil times have all been around 5 minutes with the water starting out around 50 degrees. I have also cooked oatmeal in it just to test out the “Pot” moniker. It performed flawlessly. Its greatest strength though is in its size when collapsed. In the picture I compared the height to a Smartwater bottle cap and a AA battery. For the diameter, a simple table spoon. This compacts so well, and is small enough that you can put it anywhere in your pack. That includes in the side pockets if they’re wide enough front to back. 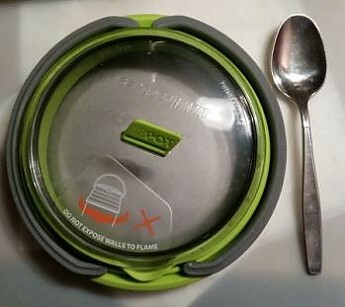 Another great feature is that both an X-Bowl and X-Mug will nest inside, along with some other small items like a lighter, scrubbie, and even a tiny Ti burner. 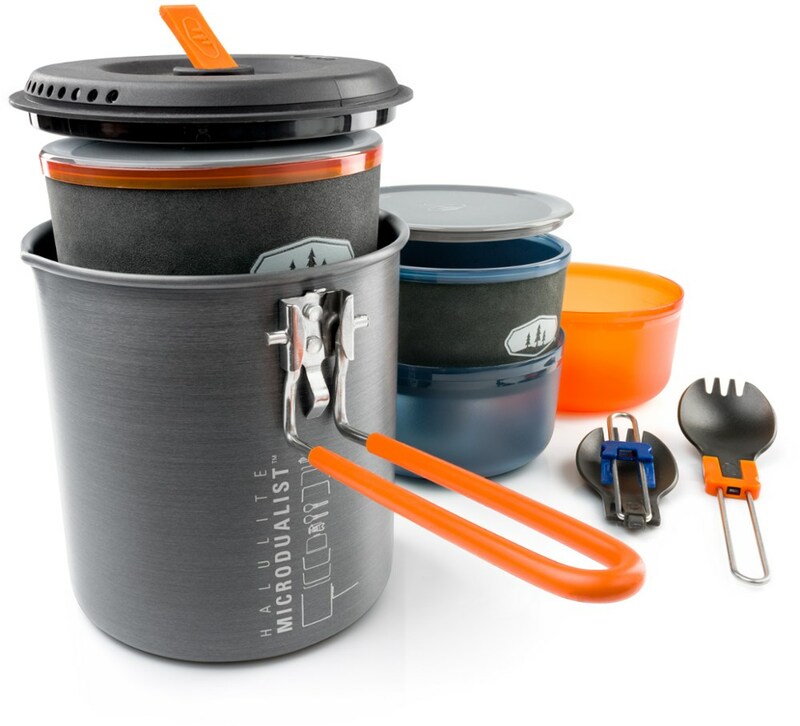 And, as mentioned earlier, it comes with a rubber band to keep the lid on and the X Kettle collapsed in your pack. 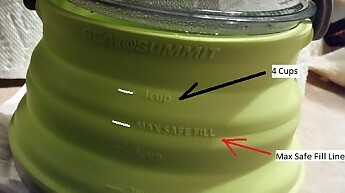 The first down side, an interesting and confusing feature of this, is the graduation marks on the side and the fact that, although it’s a 1.3L capacity, the “Max Safe Fill” line is well below that of the 4 cup mark. It actually looks to be at the 3.5 cup mark. (In the picture I tried to highlight the actual lines. On the kettle they are the same color as the sides. I intend to use a Sharpie to highlight the lines as they aren’t that easy to see). Second, is the fact that you can’t use this with alcohol stoves that don’t have some way of controlling the flames. 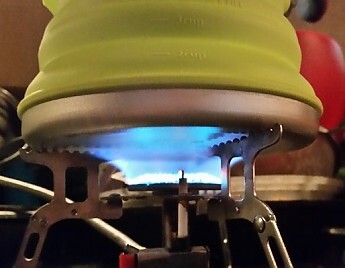 A Trangia with its simmer ring, or one of the “Ring of Fire” stoves formerly made by Smokeeater901 would work, but a Fancee Feast, Zelph, or other style of alcohol stove won’t. And a wood stove is right out of the question. Finally, its shape doesn’t allow for the use of a cozy or other way to allow you to remove it from the heat and let it sit while the food cooks inside. 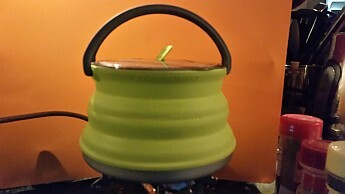 For those who don’t like to cook in the bag (I’m one of them), but do like to boil water, remove from heat, then add the food to the pot and set the pot in a cozy while the food “cooks” inside the pot. This is how I prefer to cook pasta or Ramen meals so I’m not using up fuel while cooking. You could probably make one out of Refletix, but it wouldn’t fit tightly against the kettle, so may not work as well as it does on other straight sided pots. Because of these downsides, I wouldn’t recommend it for a long trip, or a through hike. Although I listed it as a con, I’m leaning towards being more neutral in my thoughts about its weight. 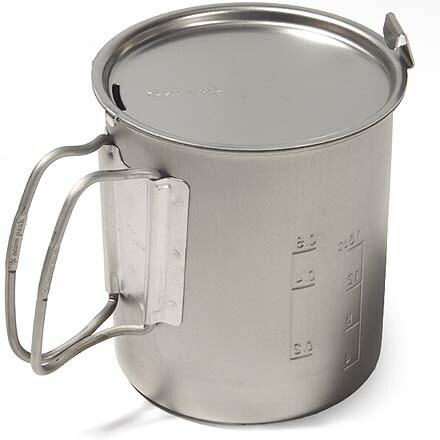 At 6.65 ounces (189 gms) this kettle/pot is comparable to most of the more popular aluminum or small stainless steel kettles and pots. So, If you’re a gram weenie, this is definitely not for you, nor would I recommend it if you’re a strictly cook-in-the-bag type. The reason I’m on the fence about its weight is, I’ve seen many a video of folks thru-hiking the PCT, AT or CDT using comparably weighted pots or kettles such as the GSI Ketalist, Minimalist, Pinnacle Soloist, MSR Windburner, Snow Peak Stainless Kettle, or a Jetboil system. All of these weigh in at the same or heavier than the X-Kettle. 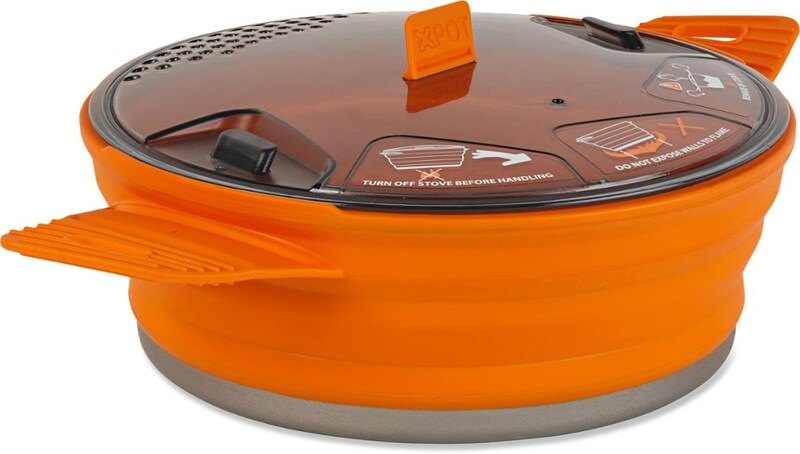 Weight alone would not cause me to not recommend this for a thru-hike, but rather the sole fact that you can’t use it with stove/burner that has an uncontrollable flame. 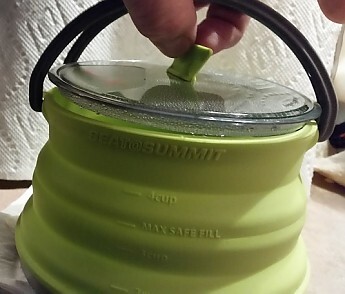 That said, if you’re looking for a packable kettle/pot combo for a short term (1–3 nights), or a car camping trip, I’d highly recommend the Sea to Summit X-Kettle. Nice review, Don! I hope you'll keep us posted on how your X-Pot Kettle continues to work out for you. Great review, Don! I LOVE my X-Kettle. I haven't quite gotten enough data for a thorough review yet, but yours was spot on from what I've seen of mine so far. I really like using a canister stove and X-Kettle better than using my Jet Boil. Thanks Alicia! I'm going to take it out in the field and see how it goes. Thanks Ashleigh, it's currently my primary kettle at home. I just love that you can squish it down and stick just about anywhere in your pack. I should have posted a couple of pics of it packed in side pockets, or the back pocket of my Arc Blast. Have fun out there, Don! I'd love to see a picture of it squished down too. Alicia: They're right there in the middle. I show it next to a spoon from the top, and next to a bottle cap and AA battery. there's also the stock photo of it collapsed. This kettle folds down to nothing and with the lid works great even in the cold. The integrated handles are great. This works great with a stove, but if you run out of fuel and need to heat water over a fire it could be a problem. Great product to use with a stove. Collapsable silicone sides make for a fussy pot. I bought this pot as a way to create more room in my bags for bikepacking, and to its credit the X-pot Kettle has done just that. Sea to Summit achieves this through a collapsable silicone sidewall attached to an anodized aluminum base. Unfortunately, this is also where the pot has its greatest weakness. If your stove flame runs around the sides of the base, you will melt the silicone. This means that you can never run your stove at full blast to heat the kettle quickly. 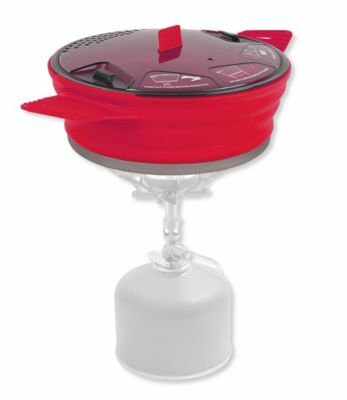 I used mine with a Trangia alcohol stove, which comes with a simmer ring. I was so worried about melting the sides, that I ran the simmer ring quite low. This meant that as my companions were eating dinner or drinking their morning coffee, I was still waiting for my water to boil. That could be chalked up to user error, but fear of ruining a not-inexpensive pot is surely something to take into consideration when making this purchase. In all, it's a well made pot, but you have to be super careful with it. It does squish down quite small. Welcome to Trailspace, Colin. Thanks for sharing a review of the interesting X-Pot Kettle. If you have any pictures of your kettle in action (squished and unsquished), I'd love to see them in your review. Best backpacking kettle I've found. Works perfectly. Best backpacking kettle I've found. Works perfectly. Doesn't weigh much. Takes up very little space in a pack. What's not to love? Just don't use it over a campfire.